Whether you're flying during dark misty winter mornings or clear bright summers evenings, a paramotor strobe light will make you more visible to other pilots. In this post we find out why you need a strobe, and we'll look at the two top choices on the market. We learned about how hard it can be for other pilots to see paramotors in > this post<. There's no legal requirement to have one, but fitting a strobe light could potentially save your life. Before we get to the strobes, let's find out why paramotors are so difficult to see, and how a strobe could help. The human eye is notorious for catching sight of moving objects, the slower an object moves the less likely you are to pick up on it. If that object is small and also blends in well with it's surroundings it becomes even harder to see. This is why prey animals caught in an open field will fall down and freeze when in the vicinity of a hunter. It then becomes much harder to spot and has a greater chance of survival. So a slow moving paramotor with a blue wing could be almost invisible to other pilots. Put that paramotor on a collision course with another aircraft and it becomes a stationary target in the windscreen doing nothing bar getting bigger. The pilot may not see it until it's far to close to make any evasive manoeuvres. Anything that can catch the attention of the other pilot in a deadly situation like this has to be a great investment. That's why manufacturers are now making dedicated paramotor strobes that are super bright and attention grabbing. 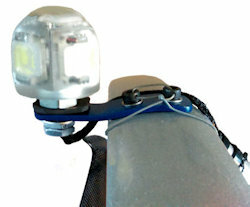 Purpose made paramotor strobes are easy to attach to your cage, they're small, light, and use very little battery power. This means you can keep them flashing during those long cross country flights, keeping you safe all the way from takeoff through to landing. There's two on the market that I've actually owned and we'll be looking at both of these in this post. There may be others out there but these two are definitely the most tried and tested strobes available. So first let's look at the most popular of the two, the Polish made Skyflar. I bought my Skyflar strobe in 2016 after a microlight pilot told me he didn't even see me as he approached me head on. You can read all about this in the linked post at the top. I got on the Flyer forum and discovered that this was a common occurrence; pilots of fast moving aircraft just don't see us until the last minute. After the incident I couldn't relax and was a little nervous at the thought of it happening to me again. I searched for a way to make myself more visible to other pilots and a strobe light seemed like the best option. I found the Skyflar on eBay with a full fitting kit and a 12 volt battery and charger pack > HERE. The supplied bracket that fixes the strobe to the cage is designed to clamp tightly onto tubular frames. If your paramotor has an aerofoil shaped frame you'll need to make your own bracket as I did below. I simply used a piece of mild steel, curved it to fit the frame, and bent it so that the strobe sat horizontally. I drilled the heads of the cap screws and ran wire through them so that they wouldn't fall out if they came loose. I chose to mount my strobe on the top of the cage so it would be visible from all angles 360 degrees. If you do this make sure you remove any sharp edges from the bracket, and keep the twisted wire ends inside the cage. This will ensure you won't damage your lines if they catch the bracket as you land. I didn't want to drill the frame so I fitted the switch using a supplied velcro strap and some cable ties. The battery also comes with a handy shock proof case which has a velcro strap so you can easily attach it wherever you like. Once fitted the leads can all be tied neatly to your frame with the supplied cable ties to keep them away from the propeller. I mounted the switch in a place that I could reach it in flight so I could turn the strobe on and off, but after a few flights I realised that this didn't matter as I kept it on at all times. I'm not sure exactly how long the battery lasted, but I was able to do around 10 flights on a single charge. For such a small lamp I was very surprised at how bright it was, it actually hurts your eyes to look at it. Even standing a few meters away from it will make you squint so don't be fooled by its size. It's set to flash 43 times per minute, unfortunately this can't be changed as I'd prefer it to be around 70, but it's OK. Skyflar say that it will be visible for up to 5 miles at dusk so other aircraft will have plenty of time to see and avoid you. It's very light and you won't notice the difference in paramotor weight once it's fitted, and it's so small it doesn't get in the way. The lamp itself measures 40 x 40 mm and the overall weight including the battery is 875 grams. I never tested it but they say it doesn't interfere with radio waves, so you shouldn't experience any interference in your headset. Overall a great little purpose built paramotor strobe light that's easy to fit and should last you many years. 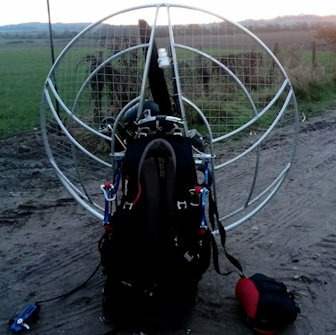 Unfortunately I can't comment on long term use as it was sold still fitted to my previous paramotor. Looking at other pilots reviews the Skyflar seems to be a very reliable long lasting strobe. Lots of my friends are also using them and they've all had positive experiences. Check the current price of the Skyflar strobe and battery kit on eBay HERE. When I bought my current paramotor I decided to try a Micro Avionics strobe as I'd heard good reviews from other pilots. It's a little cheaper than the Skyflar strobe but bare in mind that it doesn't come with a mounting bracket, switch, or battery. It turned up with a single cable tie and a screw; which I discarded. The mounting hole is on the side of this unit so this time I made a simple flat steel bracket which I mounted over rubber to reduce vibration as you can see below. I then drilled and tapped the cage and bolted it on, and once again I drilled the heads of the cap screws and used wire to prevent them coming loose. Other ways I considered were a clamp bracket, or an L shaped bracket to mount it on top of the cage. I went with the flat bracket as it worked well for my paramotor, but you could try the other methods if this way doesn't work for yours. To power the strobe I bought a Skyflar battery case like we saw earlier and a 12 V battery. This time I didn't fit a switch, instead I simply remove the battery connections after each flight. I'd have to do this anyway when I remove the cage for transport so fitting a switch seemed pointless. It's worth mentioning that Micro Avionics have included a fuse just in case you put the connections onto the wrong battery terminals. This way it'll blow the fuse instead of the bulb, so if you get one it's worth carrying a couple of spare fuses with you too because it will happen eventually. This strobe fitted well between my cage sections for good all round visibility, this was much better than being on top of the cage where the lines could catch it. It's a little chunkier than the Skyflar but it only weighs 50 grams more which isn't noticeable. Micro avionics quote it as being visible to other aircraft over 2 miles away which complies with British Microlight Aircraft Association (BMAA) requirements. This means it can also be fitted to microlights and other small aircraft. It runs the battery out quicker than the Skyflar but that is expected as it's not an LED, but there's still only a 2 Amp power consumption. It flashes 42 times per minute which is one less flash per minute than the Skyflar. Again I wish this was adjustable or set higher in manufacturing as 42 flashes isn't enough in my opinion. Micro avionics tell us it's the brightest standalone ultralight aviation strobe on the UK market. I can definitely believe that as it lights up your whole wing as you fly, which also looks very cool on those late sunset flights! Overall a brilliant, and very bright paramotor / microlight strobe light, and it's served me well so far. 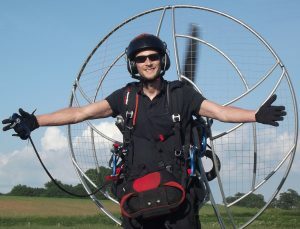 Many pilots tell me they've had them fitted to their paramotors for many years with no problems. As with the Skyflar this strobe light is fully sealed so if the bulb blows the whole unit will need replacing. 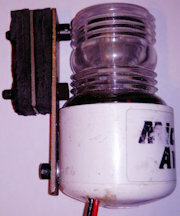 Find this strobe here on the Micro Avionics website. 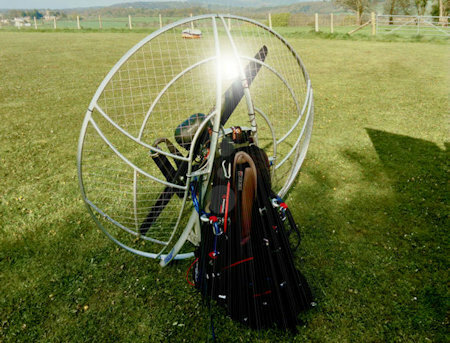 So there you have it, two awesome choices of paramotor strobe to keep you safer in the skies. The micro avionics strobe is great and I can't fault it, but the Skyflar would definitely be my first choice if I had to buy again. 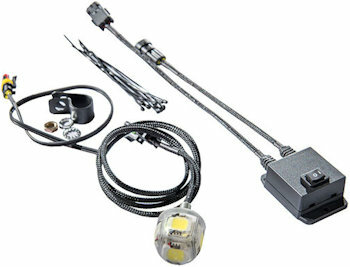 Being an LED lamp it's likely to last longer, and you get everything you need with the kit as a single purchase. After flying with many pilots using strobes I can definitely say they help with the visibility issues. Sometimes paramotors can blend in so well with the scenery that they're super hard to spot out from any angle. But when I'm flying with pilots using strobes I never have a problem spotting them out. If you're still undecided as the whether you need a strobe light; then check out THIS POST and read the mid-air collisions section. I recommend that every pilot fits a strobe, not just those flying late evenings or early mornings. 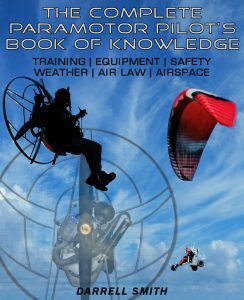 We'll finish with this quick story of turbo prop aircraft pilot filing an airprox report against a paramotorist. An airprox is a situation in which, in the opinion of a pilot, the distance between aircraft as well as their relative positions and speed have been such that the safety of the aircraft involved may have been compromised. The report stated that the aircraft was a paramotor with a blue wing and that the pilot hadn't seen it until it was just 500 meters away. The pilot of the glider responded saying that he was actually free-flying a paraglider, not a paramotor; and he was flying a pink and grey wing.. And yes it was a very near miss. He went on to say that a strobe light may have made him more visible to the other aircraft as he obviously hadn't seen him in good time to manoeuvre away. The pilots poor description shows how late that he had noticed the paraglider, he obviously only had a quick glimpse spotting him at the last second. Remember it can be very difficult for us to get out of the way on our slow moving paramotors. The sooner the other pilot can see us the more chance we have of avoiding a collision. Nothing works quite as well as a bright strobe light! When you've got yourself a strobe light check out some paramotoring essentials HERE. opinion: flashtubes/flashlamp/arc-lamp works on very high voltage, also generating high level of pulsed electromagnetic interference (close to your radio/speakers equipped helmet). I prefer low voltage LED strobe. Less worry of hi-voltage leakage in floating ground system. Excellent advice Piotr. Thanks. I’m just getting my kit list together. These weigh next to nothing and last up to six hours before needing a charge. Simple to use and attach anywhere!